Hello and welcome to ExamPundit. 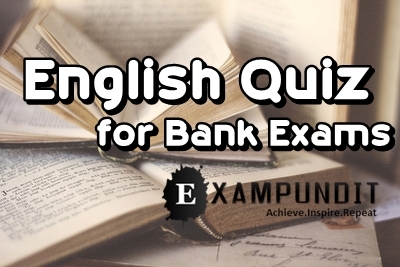 Here is a set of English Quiz based on Comprehension for Bank Exams 2015.
help you to locate them while answering some of the questions. if they have the funds, because the size of the domestic market is too small. technology with the advanced world. C. The countries with homogenous backgrounds are many in numbers. countries take up big technological planning? of China to be accomplished by the middle of 21st century? the Chinese vision can boost socioeconomic development? following have the Chinese identified as their pitfall(s) from their past? following is/are the expected result/s of China’s new vision? following is the essence of the contents of the passage? -12): Choose the word which is most nearly the SAME in meaning as the word given in bold as used in the passage. Choose the word which is OPPOSITE in meaning of the word given in bold as used in the passage.